Several years ago we came up with this popular little fellow, then he was placed in the cleaning closet and the door was shut. Now he is back, better than ever. New and improved! 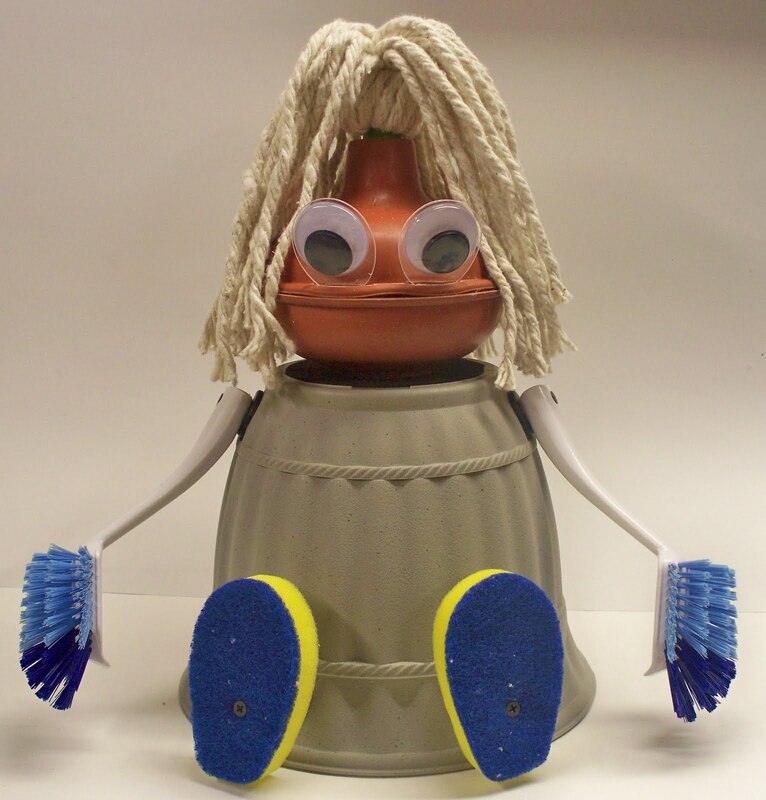 You'll clean up with this puppet! 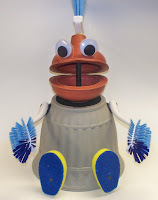 "Scrubby is made from two Plungers. 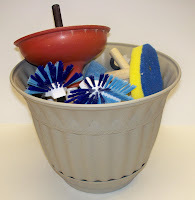 He has Scrub Brushes for feet and Cleaning Brushes for hands and arms. All can be turned in any direction. 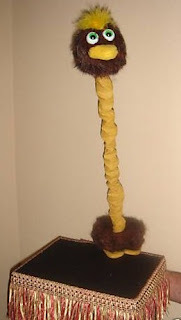 A Pot belly (body) and two types of hair (Mop & Brush). Plus eyes, of course. You can have him assembled pre-show, or you can actually quickly assemble him on stage as part of the act! Head turns, fo course, and the creative mouth design allows it to be opened and closed from the hidden control lever. Lots of surprising fun. Brush away your worries. 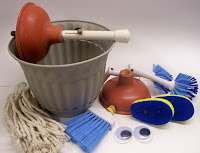 Clean house and mop up the competition! Ministry routine and special song included. 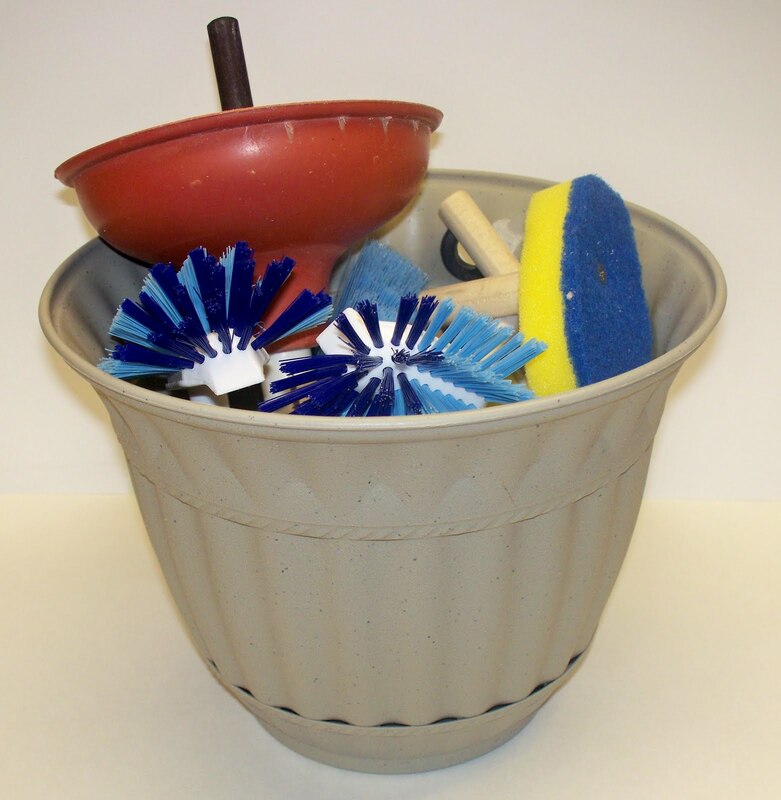 SCRUBBY $125.00 plus $10.00 shipping. I'm a versatile duck, just see what I've done. "How does he do it!" children laugh and say! It's almost magic! One second he's short and the next minute he's tall! Or any height inbetween. Head turns right to left, too! Stretch your imagination. So versatile. Peek-A-Boo would be a game he could play, from behind a couch or door. Hillarious! "Read your Bible and pray everyday" is one of his favorite tunes - when its time to "grow, grow, grow", just look at what his neck can do! OR, change the words to "read and study everyday" for programs at school, work and play. 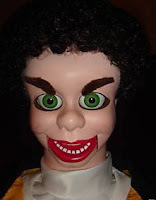 Perfect for use from a puppet stage, of course. The head turns from side to side. "Double-takes" are especially funny. Baby Stretch Duck can grow 9" to 24"! With a little help from you he can almost touch the ceiling! A comical duck that grows and shrinks; peeks and nods. 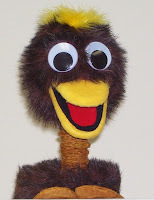 Add this little guy to your team today and watch kids laugh and say "HOW DOES THAT NECK GROW!?" Yes, this is a true ventriloquist stand. 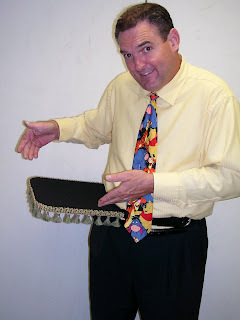 Extremely strong top that can hold any ventriloquist doll or puppet of any size. You can raise the stand up and down for your position comfort. But, there is MORE! This table top comes ALIVE! 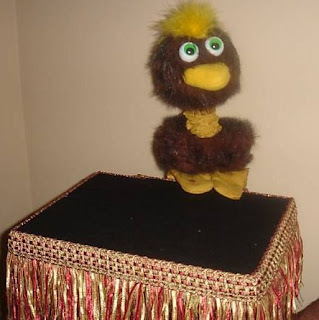 Amaze your audience and friends with the beautiful table top which turns into a true Ventriloquist Prop with side to side self-centering eyes and big easy to see moving mouth! Now we offer you a ventriloquist stand that you can use with a ventriloquist puppet or a ventriloquist figure that is hands free. No more do you have to stand in one spot or worry about tripping over the legs of your stand! Easily straps around your waist and the weight of your partner is no problem because of the design. 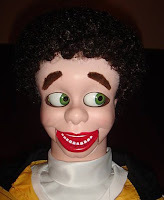 Maneuver with ease, sit ... stand ... turn ... walk ... move any way you want, go any place you wish - your ventriloquist partner is always by your side! Ask for "Side By Side" stand. Packs flat! 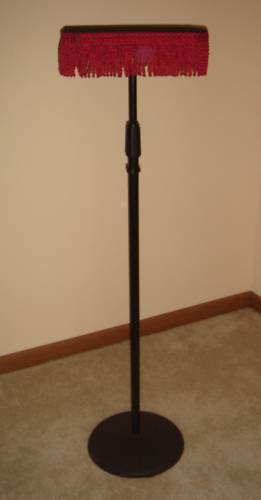 Complete Stand (Basic Table Top with Stand - as shown): $135.00 postpaid USA. Everyone needs a "Coach" in their life to give some guidance and direction, help build character, and the like, so meet "Coach Cookin'". Also known as "Ben". That's right, "Ben Cookin!" On or off the court he's ready to spice up your life with some fun! He will add some flavor to your day and he is always ready to jump in with some words of wisdom on any subject! 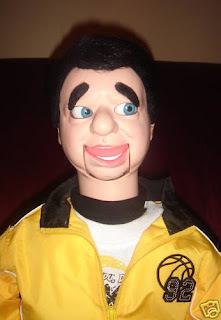 "Coach Cookin" is a 35" Ventriloquist Figure, with a hollowbody with headstick, turn head full circle, tilt, nod etc. Raising eyebrows! Coach Cookin' wants to be apart of your team! 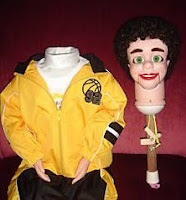 This 33" dummy has many pro features: a hollow body with headstick; head turns full circle, tilts, nods, etc. "Side to side, self-centering" green eyes. Also fitted with dual-action "raising eye brows". Not only do the eyebrows "raise" to look surprised, but they also "lower" to look angry! So easy to operate! Special designed mechanics from brass with spring loaded returns. Mechanics are super-smooth and quiet. Comes fully dressed with shoes (styles will vary). His special deluxe curly wig gives him a cool look all his own! 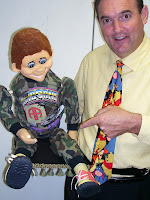 Kevin Detweiler, owner of Animated Puppets. See HOW TO ORDER for complete details. And this was a slow week! 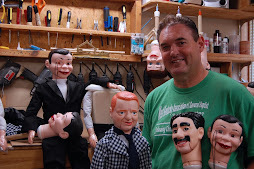 Whether it is providing conversion dolls to dealers by the dozen, or custom conversions and upgrades to individual customers one at a time, each and every job at Animated Puppets receives the skillful attention to detail that comes only from years of experience and dedication to the task at hand. That's my guarantee to you. 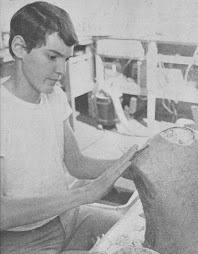 I started my personal figure making career in my father's shop at Maher Ventriloquist Studios in 1969. It's hard to believe 40 years have passed since that early beginning! The photo above was taken from a feature article in the Empire Magazine about our family's business, 12/17/1972, published by The Denver Post.